Alex: Patrick, on 02:04:05 Front242 will do the first concert in Russia ever... Did you dream to be here? Do you feel exciting? Patrick: We've been travelling a lot and there some countries where we go back for the 10th time; and although we have a lot of respect for the fans, we kind of know about it. Russia is a new experience for any of us and indeed we are very excited about it... We don't know how the people's reaction will be! Alex: I think that at least 12 years we are waiting this great moment - your live show... Have to say Front242 is very respected and cult band for every electronic music lover here.. Do you hear anything about your Russian fans? 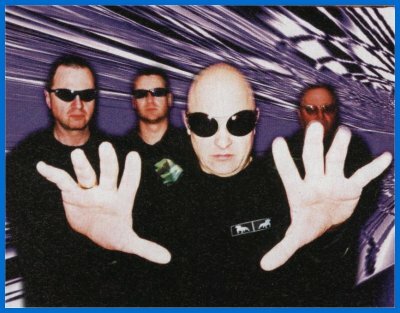 Patrick: Yes, we have contact with a lot of Russian fans through the fan club or Internet and I know that some are waiting since a long time to see Front242. It is important for us to perform a good and strong show to be able to seduce the audience and come back, maybe in other Russian cities also. Alex: If for you - what you prefer more - to work in studio or to perform live? What is more difficult or more important for you and band? Patrick: It is very different. Studio work is about sound research and working on a lot of details. It is more like an aesthetic exercise, with a specific theme for each album. «Live» is more about energy and meeting the fans, it is more emotional, sentimental. I prefer «Live» but I know that some F242 members enjoy the Studio. Alex: In Moscow we'll see each of legendary four members? Please describe your live line up? Patrick: We have one electronic drummer on stage (Tim Kroker) and a keyboard (myself); then you have two singers/performers dancing and bringing energy on stage. At the mixing board, we have Daniel; also a band member who is running the sequencers and the effects for the voices. We show also projections with original video clips especially made for the show. Alex: Patrick, as I heard your own project Red Sniper did some experiences together with visual effects and dance performance, in Moscow you will do Front242 live show together with theatre of pantomime... Is it mean that at the moment you prefer to combine various kinds of arts at stage, doing complex show, not just ordinary EBM/electronic concert? Alex: It's not a secret - your fans are always waiting for greatest hits like «Headhunter» or «Tragedy For You». Could we expect some of Front242 classics too? Do you plan any special surprises for Russian public? Patrick: We do play some classics like «HeadHunter», «Welcome to Paradise», etc... But a lot of tracks are just bringing a dance/energy feeling. Alex: Do you (and your band mates) like DJing or just clubbing? Have your Russian fans any chance to see you at afterparty? Patrick: As I mentioned, we are Djeeing but so far we were not invite to a party on Friday or any after party. Maybe next time? Alex: I hope you will have some free time during your Russian trip.. what you would like to see/visit in Moscow? Patrick: I don't really know, we arrive on Friday afternoon and I certainly plan to walk in the city for having the feeling and sensation (Architecture, people). At night, I'd like to go eventually clubbing if there is any cool club that day. Alex: Patrick, it's really interesting to know what track/album you like more from long Front242 history, all the time and at the moment? Do you have favorites from other electronic artists? Patrick: I like «Kampfbereit», «HeadHunter» ; as other artists, I listen to a lot of different music. Lately, I enjoyed : Autechre, Fischerspooner, Milo...for example. Alex: And final question - what do you want to say/wish SHOUT! Online readers and all your Russian fans? Patrick: I wish that everyone who can come to the show to really let their feelings go and take this Front242 performance as a pure «present» from the band to the Russian people ... After waiting for so long, we all finally will meet! Alex: Thank you very much for interview, see you at concert!